On October 7, 2013, the Haunted Faire rolled into the Haunted Woods for its annual presence. 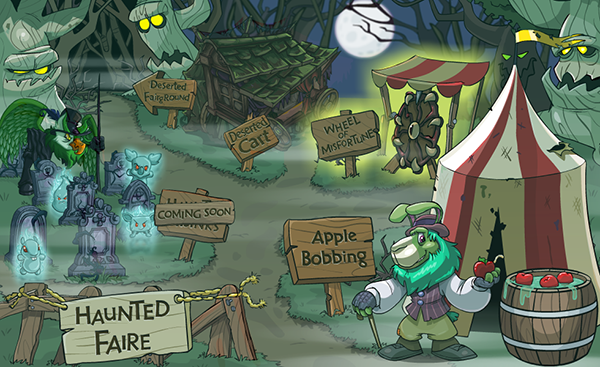 This year's fair includes: new prizes at Bart's Bart's Apple Bobbing, the return of Haunted Hijinks, and of course, the mysterious happenings at the Spooky Food Eating Contest. Before the Haunted Faire arrived in town, the previously-not-annual Spooky Food Eating Contest commenced on September 24th and ran through the 30th for a week of cheering and booing for four lucky contestants. When the contest ended, however, trouble arose. The winner, Scarlet, turned into a monstrous beast on October 2nd! Due to the monster arriving in Neovia, Saskia doesn't seem to be planning an appearance this year.